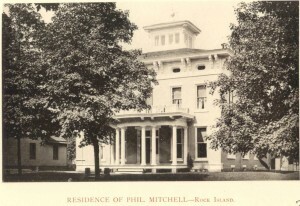 For years this stately home on Rock Island’s 20th Street just south of 7th Avenue has been known as the Mitchell House. 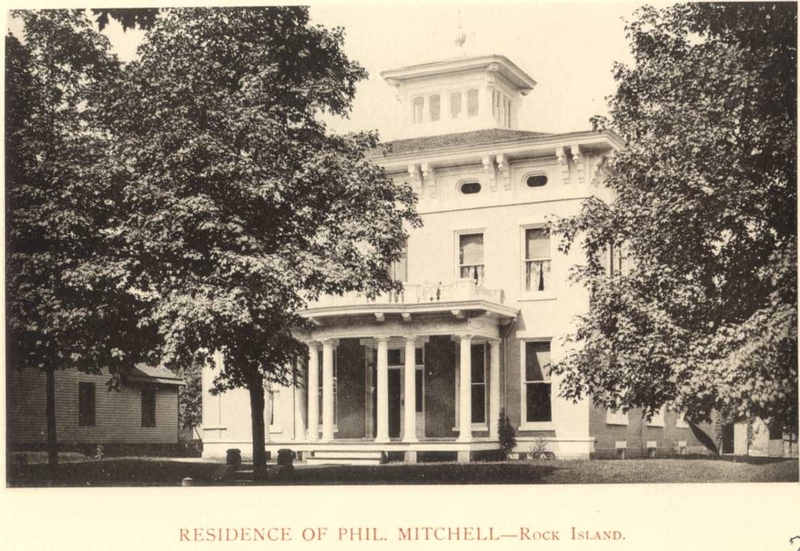 It is named for Phil Mitchell, a scion of the most prominent banking family in Rock Island, who entered the banking field in 1861, when he was only 15 years old. By the time he died in 1928, he had been president of two banks, as well as the president of Rock Island Plow Company and Director and Vice President of the Rock Island Stove Company. And he lived in this house for nearly forty years. Case was one of the earliest settlers of this area, having come here at age 15 in 1829. His parents, Sarah (Sally) and Louden Case, Sr., and his two brothers, Jonah and Louden, Jr., settled on land near the Rock River. Charles’ father died in August 1830 and his mother in February, 1836. Two months later, Charles married Margaret Hartzell. But only three years later, he died, leaving the home, valued at $11,000, as well as the family farm, to Margaret, their two daughters, and a son. Clues to the Case family’s interior décor are found in the detailed list of his estate which included 23 yards of Brussels carpet in the parlor, 15 yards of Brussels carpet in the hall and stairs, and another 15 yards of ingrain carpet in the bedrooms. Other items of note include 11 dining room chairs, a melodeon, and a haircloth sofa. Margaret remained in the home until selling in 1885 to Ben Harper, who then sold to Homer J. Lowery. Lowery would go on to build what is now known as the Victorian Inn just north of the Case house, which he then sold, in December of 1886, to Phil Mitchell’s wife, Ella, for $9,000. In that era, homes were often registered in a wife’s name, rather than the husband’s. The home that Charles Case built was a classic Italianate style cube, with a shallow hipped roof. Paired brackets supported the roof eaves, and framed small attic windows. While many Italianates were being built in this era, the Case home was special because of its belvedere, an outstanding feature that remains today. Belvedere, which translates as “beautiful view,” is an apt name for this picturesque rooftop room with windows on all four sides. 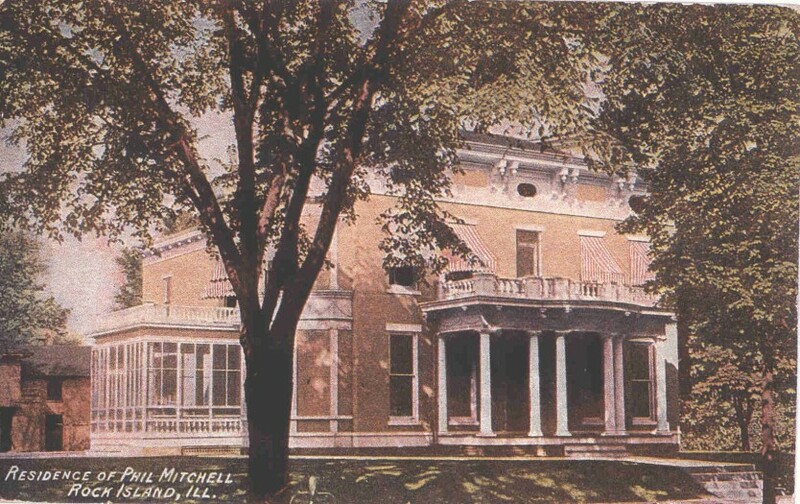 The Mitchells, who had wed in 1877, enlarged and changed the house. In 1892, the home had a small front porch and a modest sized two story wing at the south rear of the rectangular house. This wing may have been original or added by the Mitchells. Between 1892 and 1898 the rear wing was doubled in size, nearly equaling the size of the front of the house. The front porch was expanded to its current size and configuration, and a two-story semicircular bay was added on the south side. About 1908, a sunroom or conservatory was added to the main house directly behind the bay. In one of the early constructions periods, the interior was “updated” to incorporate classical motifs such as the swags that can be seen on the postcard on the bay frieze band. This work may have been the creation of architect George Stauduhar, as several exterior and interior photographs of the remodeled interior are included in his archives at the University of Illinois. However Stauduhar took photographs of buildings other than those of his own design. shows the house looking much the same except all of the attic level windows were unobscured. After Phil’s death in 1928, Ella remained for a few years. But by 1935, the home had been converted to three apartments with an absentee owner. A tea room also operated here for a few years. By 1940, this once magnificent home and its large barn and stables had been converted to 14 apartments. Decades later, nearby residents recounted seeing piles of walnut paneling tossed out on the front lawn during the conversion. Forty years later, it was scheduled for demolition as an acknowledged long term eyesore and dangerous building. The Broadway Historic District Association asked the city of Rock Island to delay demolition, then provided some financial help to install a large tarp on the leaking roof and to advertise the home. Thanks to the full cooperation of the city, new owners were finally found. The Mark and Deb Holmes family agreed to assume the difficult task of rescuing this historic home. Working carefully with what remained and reproducing many components, they have revitalized the Case-Mitchell House. Thanks to new structural underpinnings and detailed restoration of decorative elements, including the once missing front porch, the home has a bright future. The Cases and the Mitchells would certainly be proud of this latest family to enjoy their former home. This article, by Diane Oestreich, is slightly modified from the original, which appeared in the Rock Island Argus and Moline Dispatch on July 1, 2007.